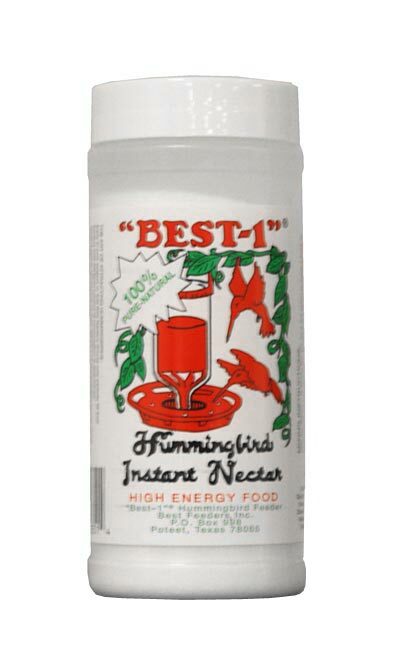 Keep your hummingbird feeders full of nectar using the Best-1 Instant Hummingbird Nectar. This natural powder has no color or preservatives, for a healthy food source for your birds. Mix 8 ounces of this powder with 32 ounces of hot water to create clear, fresh nectar. Once cooled, the nectar can be used in any of your hummingbird feeders, offering them the energy they need. Place any excess nectar in your refrigerator, for a fresh supply. Fill your hummingbird feeders with nectar using this Instant Hummingbird Nectar. Made in the USA. Many birders opt to use instant nectar as it can be made conveniently. Nectar may also be made at home by boiling water and mixing in white granulated sugar. Be sure to check our directions for making your own Hummingbird Nectar at home if this interests you.